"Whiplash" is cinematic adrenalin. In an era when so many films feel more refined by focus groups or marketing managers, it is a deeply personal and vibrantly alive drama. Damien Chazelle has taken a relatively staid subject like the relationship between a music student and his teacher and turned it into a thriller built on a brilliant undercurrent of social commentary about what it takes to make it in an increasingly competitive and cutthroat world. How far are you willing to push yourself to succeed? How far are you willing to push someone else to force them on the path to success? Carried by two electric performances, the tightest editing in a film this year and a daring screenplay that writes itself into a corner and then somehow finds an unexpected way out, "Whiplash" is as breathless as a drum solo, rising and falling just as the hopes and dreams of its protagonist climb and crash. A young man named Andrew Neyman (Miles Teller) is practicing late at night at his New York music school, one of the best in the country, when his drumming catches the ear of the infamous Mr. Fletcher (J.K. Simmons), the most important teacher at the school and the conductor for its most important jazz band. Fletcher pauses, listens, barks a few orders at the young man, and moves on, seemingly dissatisfied with what he heard. Andrew had his chance, that one brief moment many of us have to impress the people who can change our lives, and he didn't cut it. He goes back to his routine class band, telling his dad (a wonderfully genuine Paul Reiser) that his opportunity to move up probably passed him by. Of course, Fletcher's dismissal of Andrew in that first scene is just the first of many examples of what could politely be called his "teaching style." Fletcher likes to tell the apocryphal story of how Jo Jones threw a cymbal at Charlie Parker's head one night when he messed up, thereby pushing him to the breaking point at which he became Bird. Without that cymbal, would music history be the same? Would Charlie Parker have gone home, refined, practiced and driven himself without the threat of not just failure but physical violence? Fletcher uses that kind of barbarous technique on his students: throwing furniture, calling Andrew names, playing mind games and physically torturing him with repetitive drum solos until he bleeds on the kit. But that blood feeds his musical passion. And Andrew blossoms, asking out the cute girl he's been afraid to talk to before, and taking first chair in the most important band at the most important music school in the country. Miles Teller, so great in breakthrough roles in “Rabbit Hole” and “The Spectacular Now,” does the best work of his young career here as Andrew, finding the perfect blend of insecurity and confidence that comes entangled in the core of a young talent. Andrew is naturally apprehensive, but he also knows he has a drive, a passion, a skill that is unique. Teller walks that line, never faltering by making Andrew too confident while also carefully letting viewers see the spark within that Fletcher fuels. As for Simmons, Fletcher could have been such a caricature in the wrong actor’s hands. An over-the-top, abusive teacher is a part riddled with pitfalls. Simmons falls into none of them. He walks such a line that, even after the kind of inhumane mind games and physical abuse that should produce legal charges has unfolded on screen, we find ourselves drawn to Fletcher. He’s not 100% wrong when he says that the most dangerous two words in the English language are “good job.” Whether you think it's the right approach or not, we’re in an era of praise, where encouragement is the teaching tool and every kid gets a medal for participation. Have true talents been left to wither because they were over-watered? Simmons perfectly captures the drive of a man who believes his abusive degree of pressure is the only way to produce a diamond. 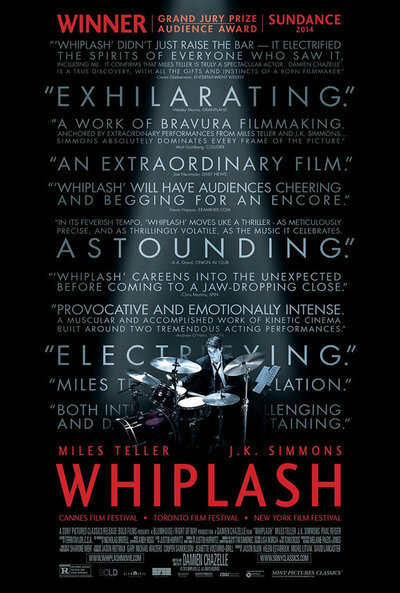 While “Whiplash” would be a notable film purely for Teller and Simmons’ performances, it reaches a different level when one considers the execution of its tempo. Editor Tom Cross and cinematographer Sharone Meir often put us right on stage with Andrew and Fletcher, cutting and panning in rhythm with the beat of the drum. It is captivating, to say the least, particularly in a climax that produces more tension than any action film or thriller this year. The title refers to a song played multiple times throughout Chazelle’s film. It could also refer to that sense of wowed exhaustion you’ll feel when it’s over.